Automatic milk frothers are a great way to make either hot or cold milk froth for your morning cappuccino or iced caffeine drinks. The Epica automatic electric milk frother is our top pick- this 2.5 pound automatic frother has three different settings to make cold froth, hot froth and hot milk. It can froth heavy cream, whole, and even low-fat and non-dairy types of milk like almond or soy. It's an all-in-one frothing solution for your cappuccino, cocoa or other specialty caffeine creation. It is an especially quiet foam frother that brews an especially fine froth, with one former Starbucks barista writing that it produces great-tasting milk foam quietly with minimal cleanup. Buyers say you can even add sugar into it, froth it, and get a delicious, milky dessert! In addition, it's incredibly quiet and simple to use. One thing you should pay attention to, the Top Max line inside the unit is only for warming, not frothing. If you disregard it, it'll spill over the edges and you'll end up with a big mess. You do have to clean it after every use. It ships with a wipe, which is convenient to use- but a good rubdown with a damp sponge will also suffice. Let's take a look at five of the best-selling electric automatic milk frothers on the market today and see how they compare. The Epica Automatic Electric Milk Frother and Heater Carafe is one of the automatic frothers on the market that works with both hot or cold milk for making froth for cappuccino or for delicious iced drinks and heated drinks such as lattes. 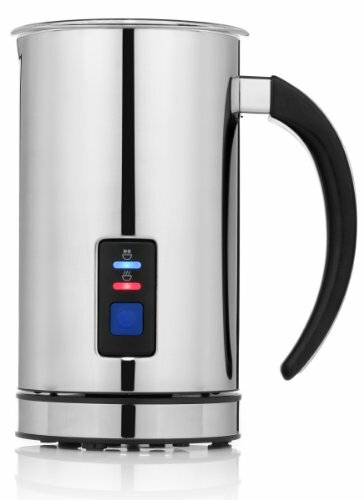 Some of the features of stainless steel, its vacuum insulation system, its detachable carafe for easier pouring and has a 4.25 oz frothing capability. One feature users like about these automatic milk frothers is that they have three different settings, one for hot froth, one for cold froth and one just for hot milk. Another nice feature that users like about this unit is that it is specially made for home and personal use and makes a perfect individual cup each time used. The frother itself is also extremely quiet and users often have to check to see if it’s actually working. Some users have had issues with it overflowing and making a mess. The Chefs Star Premier Automatic Frother, Heater and Cappuccino Maker is an automatic frother that is made of high-quality stainless steel. This allows for easy and quick clean up- a lot of users like that about this unit. As far as automatic frothers go this one is very stylish and has a very durable design and comes with a detachable base that a lot of its users enjoy because it makes it easier for them to pour and serve the finished product. Another nice feature its users enjoy is that it will automatically froth 5 ounces of milk and will automatically heat 8.5 ounces of milk. They also like the speed of these automatic frothers, they can heat cold to hot milk in just 80 seconds. The unit also includes two different whisks, one that is just for frothing and the other one is just for heating. One other unique feature of these frothers is that they not only will froth whole milk but they also can froth low-fat and non-fat along with almond and soy . Some users have found that these automatic frothers have an issue with being inconsistent and will sometimes overflow and can be difficult to clean. 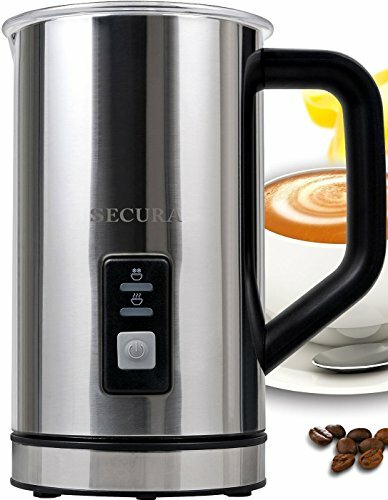 The Secura Automatic Electric Milk Frother and Warmer is a milk frother that has a maximum capacity of producing 5 ounces of froth and 8.5 ounces of heated milk. This is one of the few automatic frothers that includes a maximum level indicator for milk froth and milk warmer as well as minimum levels which a lot of users have found quite convenient when preparing any hot and cold beverages with this unit. Users also like its stainless steel exterior that has nice vacuum insulation for keeping things warm for a longer period of time. This is one of the few options that also comes with its own cleaning brush, something users like because they don’t have to go out and buy one as an added accessory. A key thing about these automatic milk frothers that many users have commented on is the customer service they receive from Secura, which is top notch. 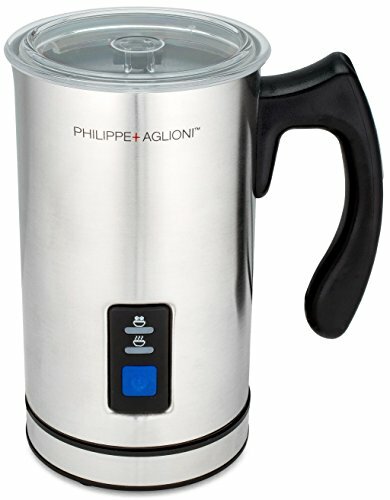 The Philippe Taglioni Automatic Electric Frother Jug is a frother that many users say helps to create frothed milk quite effortlessly and it’s one of the few automatic milk frothers on the market that actually is easiest to clean because it has a non-stick interior to cut down on leaving behind any burnt film after using it. This is something users appreciate immensely. These automatic frothers easily help users create thick frothy drinks such as cappuccino, latte, hot frothed milk as well as hot chocolate for the entire family. These automatic frothers also come with whisks to use for frothing and for heating milk. 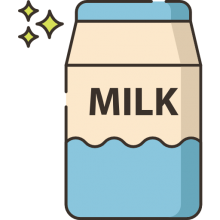 The unit can also froth low-fat, non-fat, almond and soy milk for those who prefer not to use whole milk in their beverages. Users like the detachable base and the handy handle on the frothing jug making it a lot easier to pour and serve any beverage made. Some users have discovered and have enjoyed the fact that you can also make your own whipped cream with these automatic frothers which for some is a great added feature. The only negative some users have found is that the frother can spin too fast and spills the liquid out of its cup. The Nespresso Aeroccino Plus Frother has a lot of nice features and users love the speed of just 70 seconds from cold to hot for any hot beverage. 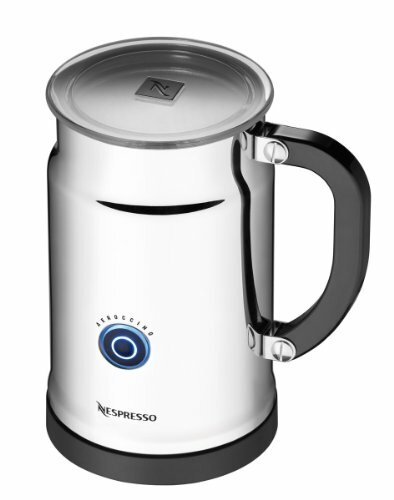 These automatic frothers can froth about 4 ounces of milk and about 8.5 ounces of hot milk for any beverage. They also include both maximum and minimum level indicators that users like so they know how much or little they can put in the unit for proper operation. Users also like the nice and easy carry handle once these automatic frothers are removed from their base. The handle makes it easier for users to carry and to serve the finished product. Users who have used this company’s automatic frothers in the past compliment the company on improvements such as easier to clean than previous models because it has a new and improved non-stick interior making less chance of leftover residue. Another reason why users like this unit is because it can now be submerged in water making it a lot easier for clean up. One thing users noted about these auto frothers is that if you don’t clean them really good, the next time one is used it can cause spilling during its second round of frothing. If you are looking to purchase a fr﻿﻿other that produces high-quality, delicious as well as consistent micro-foam that can either be hot or cold, check out some of the options that we have reviewed on this page. It is the protein that actually produces the foam's structure. While skim will make a really fine foam, most users agree that whole makes for a creamier tasting and textured foam. Of course, the sort of foam you produce will depend entirely on your own taste. Some vegans will prefer using almond or soy milk to flavor their caffeine creations, while more traditional coffee drinkers and cappuccino fans will undoubtedly prefer using a 2 to 3% milk or whole milk option. Indeed, they're great gift options if you know what a coffee drinker in the family that would enjoy the ability to create great-tasting coffee creations all with the press of a button. Some of the units even come with different whisks for frothing and heating. In general, they are pretty easy to set up and use with intuitive controls- though many users caution that you shouldn't submerge it in water because it will burn out the device. If you're looking to purchase an automatic frother to supplement your coffee or caffeine creations in the morning, read the reviews on this page and check out the comparison table- you can also head over to the individual product pages to read what other consumers are saying about the option that you are considering purchasing.